Print Labels and Receipts Whenever you need them, Wherever you need them. The TracerPlus Print Plug-in is now included at no additional charge in TracerPlus Standard and in TracerPlus Professional. This plug-in extends TracerPlus into a powerful mobile printing solution. Use it in retail for shelf relabeling and markdowns; in manufacturing, use it to streamline your shipping and receiving processes; in transportation, use it for receipts and waybills; in healthcare, use it for specimen labeling. When it comes to mobile printing, TracerPlus Print is the right choice. Customizable print formats for mobile printing of invoices, purchase orders, packing slips and labels. Supports most mobile printers including Datamax-O'Neil, Zebra and Intermec. Built in print commands and report filters enable powerful flexible printing directly from TracerPlus. Calculation variables add power to processes in the field. Mobile Printers; Datamax-O'Neil 8i, 4t, 2t; Zebra P4T, QL, MZ and RW series' and most other mobile printers. Most desktop printers through 802.11 WLAN and Bluetooth connections. 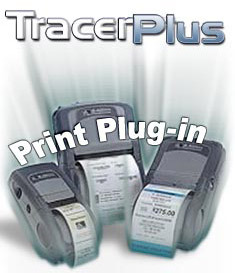 The TracerPlus Print Plug-in is integrated within the TracerPlus Mobile Client for Windows Mobile/CE/Android and therefore does not require any additional installation. After purchase and registration, print capabilities can be enabled via an option in TracerPlus Desktop. Don't waste time learning to create and keep track of different file formats associated with various printers. A PTS certified software specialist will contact you to create your label or receipt specification, configure a PTS Print Format file for your application and assist in its installation. These popular kits include everything you need to start printing directly from your Windows Mobile/CE or Android Mobile Devices, SmartPhones and Tablets. PTS offers a selection of Mobile Printers designed for a variety of uses. Featuring a range of Zebra and Datamax-O'Neil printers, PTS can help you decide which model is best for your needs. PTS also provides a wide array of accessories and additional label and receipt rolls which can be purchased separately.